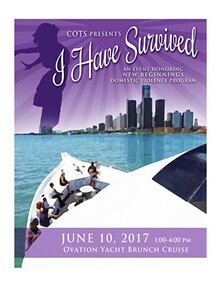 Coalition On Temporary Shelter’s (COTS) New Beginnings Domestic Violence Program is one of only two Detroit agencies serving homeless survivors of domestic violence and is a vital lifeline for many families. COTS leaders are dedicated to continuing this crucial program despite six-figure funding cuts and needs the communities help. Please join them as they cruise for a cause aboard the Ovation Yacht to celebrate the programs success and support its future. Brunch will be served and entertainment will be provided by the Les Williams Trio. Boarding will begin at 12:30 p.m., cruise wear is encouraged.